We’ve got such incredible news for you, movie lovers! Mechanical Eye was awarded the Grassroots Arts Program Subgrant by the Asheville Area Arts Council and North Carolina Arts Council to bring THREE visiting filmmakers to Asheville to show their work, talk about their practice, and share with you their skills! We are thrilled to announce that Wenhua Shi, Monte Patterson, and Arpita Kumar will be here in November/December to present programs of their work! Want to learn projection mapping (for your installation) but don’t know where to start? We will teach you! The workshop will show participants the essential design fundamentals of video projecting and mapping. Projection mapping is a technique of projecting animation/video onto a three dimensional surface. Participants will learn the basics of video mapping software. This workshop is intended for anyone who wants to learn how to develop projection mapping projects for future events, art installations, and performances. Wenhua Shi is currently an Assistant Professor in the Department of Art at UMass Boston. Originally trained as a doctor in China, Wenhua departed from the medical field and began working in radio and TV in his hometown of Wuhan. He received his Bachelor of Arts and Bachelor of Fine Art in Film from the University of Colorado, Boulder. In 2009 he graduated with an MFA from Art Practice at the University of California at Berkeley. His works have been screened or exhibited at Pacific Film Archive, Black Maria Film Festival, Smithsonian Freer Gallery of Art, and Arthur M. Sackler Gallery, The National Museum of Film, Photography and Television (UK), Experiments in Cinema, Albuquerque, Denver Contemporary Museum of Art, Beijing Film Academy, Berlin International Directors Lounge, The Jack Kerouac School of Naropa University, and dozens of international film festivals, including Rotterdam, Hamburg, Bradford, and Mexico City. West Bund 2013: a Biennale of Architecture and Contemporary art, Shanghai, Shenzhen & Hong Kong Bi-City Biennale of Urbanism, International Arte Laguna Prize, Finalists Exhibition, The Arsenale of Venice in Italy. Wenhua Shi is a 2015 Fellow in Interdisciplinary Work from the New York Foundation for the Arts. Experimental narrative shorts about transformations from one plane of being to another based on the lives we live. A filmmaker’s artist talk about social media and the ways in which a film’s final image encapsulates and punctuates stories. We hope you can make it to all of these events! There are filmmakers out there who make powerfully personal films. And there are filmmakers out there who are incredibly generous people. And then there’s Bill Brown and Sabine Gruffat, who are both brilliant, articulate, talented makers, and two of the most incredible people I’ve ever encountered. It is with such honor and excitement that they will join us this Thursday for the presentation of their film, Speculation Nation. The global financial crisis that began in 2007 battered Spain. Over a quarter of the population lost their jobs, and hundreds of thousands of people lost their homes. The constitutional guarantee for housing that has been a cornerstone of Spain following the death of Francisco Franco has been shaken by a combination of greedy real estate speculators, predatory banks, corrupt public officials, and a global financial catastrophe. Bill Brown and Sabine Gruffat travel across Spain to document the consequences of the housing crisis. What they find are Spanish citizens, inspired by the politics of The 15M Movement and Occupy Wall Street, who are mobilizing, collectivizing, and fighting for their right for a decent place to live. Along the way, the filmmakers visit young mothers and their families squatting in failed condo developments; intentional communities of mountain cave dwellers; protest campsites that have sprung up in front of bank branches; and empty apartment buildings transformed into experiments in Utopian living. Speculation Nation examines the ideologies that separate housing from home, and real estate speculation from speculations about a better way to live. Filmmakers Bill Brown and Sabine Gruffat will be here IN PERSON for a talk back and Q&A! Tickets $5 suggested donation. Money goes to support the visiting artists and help make these events possible! 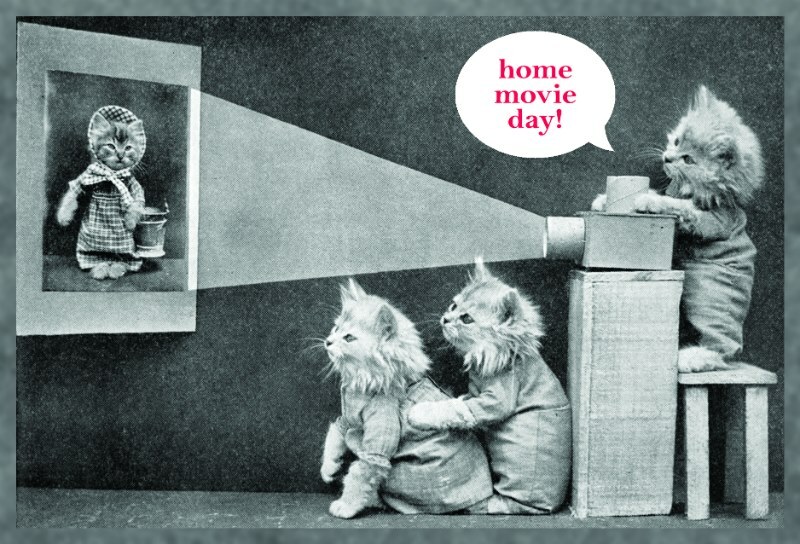 Dust off your old home movies and bring them to the West Asheville Public Library for HOME MOVIE DAY! Home Movie Day is a celebration of amateur films and filmmaking held annually at dozens of local venues worldwide, providing the opportunity for individuals and families to discover how best to care for their films and get a rare chance to view examples of home movies. Traditionally held on the third Saturday in October (October 17th in 2015), dates for individual events will take place in October and November. Home Movie Day has grown each year from its initial slate of two dozen locations across the U.S., Mexico, Canada, and Japan in 2003. Volunteers will inspect and project 16mm, 8mm, and Super 8 film. We will also project DVDs, VHS, & VHS-C. If you have any other oddball formats (28mm, 9.5mm, etc. ), HMD representatives can help you find a safe, cost-effective way to view these prints. Nope. You’re welcome to stop by and just watch other people’s home movies. This isn’t a film screening where you need to stay silent. The more the audience contributes, the more fun it is. Your commentary will be much appreciated! I have a whole box of ’em! Can we watch ’em all? Nobody likes a home movie hog. Bring as many films as you’d like, but we’ll be screening one reel (3-5mins) from each participant until everyone has had a chance to see their home movies. After that, second helpings are totally fine–especially in Kodachrome. Nope. We’ll just inspect and project your home movies and return them to you in comparable condition. If there are broken perforations or cracked frames, we’ll fix those and return the films in better condition! Keep in mind that decades-old films are fragile and there’s an inherent (though slight) risk of damage during any projection. If we do not feel that the film can be safely projected, we will not screen it. Home Movie Day is free, but donations are always welcome to defray costs.